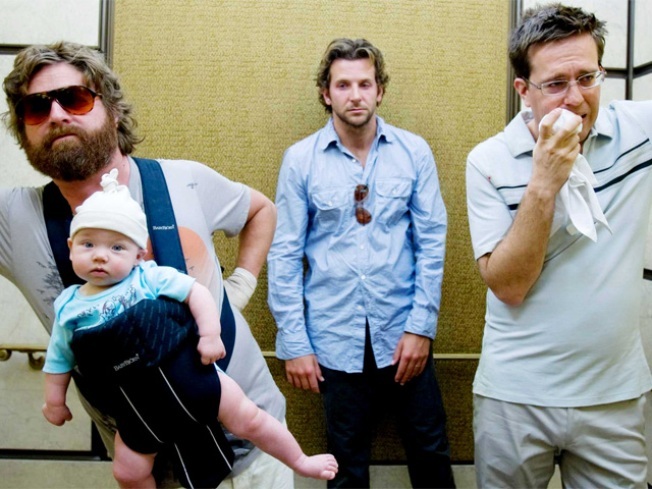 "The Hangover" was one of the most popular comedies of 2009. THE BENDS: You're a weekend warrior -- no one can party as hard as you -- and so why not sure that hangover with a different kind of warrior. As in the yoga postion. CrossFit 305 offers up Hangover Yoga, tought by Sweat Records'Lolo. Bring your own mat and 10 bucks. 6:30-8:30 P.M.
STRUNG OUT: We're not sure if they'll allow any Stairway to Heaven, but the Miami Guitar and Rock Fest at the Fishhouse is sure to be riff-tastic. In addition to plenty of local rock goodness, there will also be giveaways and drink specials. The licks start at 5 P.M.
LIV IT UP: We could really just live at, well, LIV from Wednesday through Sunday, what with their stellar lineup of fun. Imagine Sundays will guarantee you take the weekend out with a bang, as this party, formerly the "it night" at The Forge, is known for its celeb cameos. But even if you don't get a Kanye spotting, rest assured your night will still be fabo with DJs Don P and Stevie J spinning. 11 P.M.